RISC operators for interval domains. Definition at line 327 of file IntervalSemantics2.h. Print multi-line output for this object. 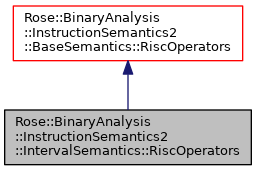 Instantiates a new RiscOperators object and configures it to use semantic values and states that are defaults for IntervalSemantics. Definition at line 348 of file IntervalSemantics2.h. References Rose::BinaryAnalysis::InstructionSemantics2::IntervalSemantics::SValue::instance(), Rose::BinaryAnalysis::InstructionSemantics2::BaseSemantics::RegisterStateGeneric::instance(), Rose::BinaryAnalysis::InstructionSemantics2::IntervalSemantics::MemoryState::instance(), Rose::BinaryAnalysis::InstructionSemantics2::BaseSemantics::State::instance(), and Rose::BinaryAnalysis::InstructionSemantics2::BaseSemantics::RiscOperators::solver(). Instantiates a new RiscOperators object with specified prototypical value. An SMT solver may be specified as the second argument for convenience. See solver for details. Definition at line 358 of file IntervalSemantics2.h. Instantiates a new RiscOperators with specified state. Definition at line 364 of file IntervalSemantics2.h. The protoval is a prototypical semantic value that is used as a factory to create additional values as necessary via its virtual constructors. The state upon which the RISC operations operate must be set by modifying the currentState property. An optional SMT solver may be specified (see solver). Definition at line 371 of file IntervalSemantics2.h. The supplied state is that upon which the RISC operations operate and is also used to define the prototypical semantic value. Other states can be supplied by setting currentState. The prototypical semantic value is used as a factory to create additional values as necessary via its virtual constructors. An optional SMT solver may be specified (see solver). Definition at line 376 of file IntervalSemantics2.h. Run-time promotion of a base RiscOperators pointer to interval operators. This is a checked conversion–it will fail if from does not point to a IntervalSemantics::RiscOperators object. Definition at line 386 of file IntervalSemantics2.h. Create a new SValue from a set of possible bits. This is just a convience function so that we don't have to see so many dynamic casts in the source code. Definition at line 398 of file IntervalSemantics2.h. Create a new SValue from a set of intervals. Definition at line 404 of file IntervalSemantics2.h. Computes bit-wise AND of two values. The operands must both have the same width; the result must be the same width as the operands. Computes bit-wise OR of two values. The operands a and b must have the same width; the return value width will be the same as a and b.
Computes bit-wise XOR of two values. The operands a and b must have the same width; the result will be the same width as a and b. The result will be the same size as the operand. Extracts bits from a value. The specified bits from begin_bit (inclusive) through end_bit (exclusive) are copied into the low-order bits of the return value (other bits in the return value are cleared). The least significant bit is number zero. The begin_bit and end_bit values must be valid for the width of a.
Concatenates the bits of two values. The bits of a and b are concatenated so that the result has b in the high-order bits and a in the low order bits. The width of the return value is the sum of the widths of a and b. Returns position of least significant set bit; zero when no bits are set. The return value will have the same width as the operand, although this can be safely truncated to the log-base-2 + 1 width. Returns position of most significant set bit; zero when no bits are set. Rotate bits to the left. The return value will have the same width as operand a. The nbits is interpreted as unsigned. The behavior is modulo the width of a regardles of whether the implementation makes that a special case or handles it naturally. Rotate bits to the right. The return value will have the same width as operand a. The nbits is interpreted as unsigned. New bits shifted into the value are zero. If nbits is equal to or larger than the width of a then the result is zero. Returns arg shifted right logically (no sign bit). Returns arg shifted right arithmetically (with sign bit). The return value will have the same width as operand a. The nbits is interpreted as unsigned. New bits shifted into the value are the same as the most significant bit (the "sign bit"). If nbits is equal to or larger than the width of a then the result has all bits cleared or all bits set depending on whether the most significant bit was originally clear or set. Determines whether a value is equal to zero. Returns true, false, or undefined (in the semantic domain) depending on whether argument is zero. Returns operand a if cond is true, operand b if cond is false, or some other value if the condition is unknown. The condition must be one bit wide; the widths of a and b must be equal; the return value width will be the same as a and b. Extend (or shrink) operand a so it is nbits wide by adding or removing high-order bits. Added bits are always zeros. The result will be the specified new_width. The result will the the specified new_width, which must be at least as large as the original width. Adds two integers of equal size. The width of a and b must be equal; the return value will have the same width as a and b. Add two values of equal size and a carry bit. The carry_out value is 11100100. The width of a and b must be equal; c must have a width of one bit; the return value and carry_out will be the same width as a and b. The carry_out value is allocated herein. The return value will have the same width as the operand. The width of the result will be the same as the width of operand a. Calculates modulo with signed values. The width of the result will be the same as the width of operand b. The width of the result will be the sum of the widths of a and b. The width of the result is the same as the width of operand a. Calculates modulo with unsigned values. The width of the result is the same as the width of operand b. The width of the result is the sum of the widths of a and b. Reads a value from memory. The implementation (in subclasses) will typically delegate much of the work to the current state's readMemory method. A MemoryState will implement storage for memory locations and might impose certain restrictions, such as "all memory values must be eight bits". However, the readMemory should not have these constraints so that it can be called from a variety of Dispatcher subclass (e.g., the DispatcherX86 class assumes that readMemory is capable of reading 32-bit values from little-endian memory). The designers of the MemoryState, State, and RiscOperators should collaborate to decide which layer (RiscOperators, State, or MemoryState) is reponsible for combining individual memory locations into larger values. A RiscOperators object is passed along the chain of delegations for this purpose. The RiscOperators might also contain other data that's import during the process, such as an SMT solver. The segreg argument is an optional segment register. Most architectures have a flat virtual address space and will pass a default-constructed register descriptor whose is_valid() method returns false. The cond argument is a Boolean value that indicates whether this is a true read operation. If cond can be proven to be false then the read is a no-op and returns an arbitrary value. The dflt argument determines the size of the value to be read. This argument is also passed along to the lower layers so that they can, if they desire, use it to initialize memory that has never been read or written before. Read memory without side effects. This is a lower-level operation than readMemory in that it doesn't cause any side effects in the memory state. In all other respects, it's similar to readMemory. Writes a value to memory. The implementation (in subclasses) will typically delegate much of the work to the current state's writeMemory method. The cond argument is a Boolean value that indicates whether this is a true write operation. If cond can be proved to be false then writeMemory is a no-op.